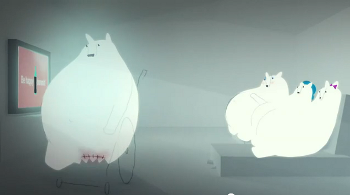 For years, Coca-Cola has aired ads featuring adorable animated polar bears that just love to drink the brown beverage. But a new video — created by the ad genius behind commercials for Burger King and yes, even Coca-Cola — tries to use those bears to push a message about guzzling too much soda. The spot, released by the folks at the Center for Science in the Public Interest, a group that has never hid its disdain for soft drinks and fast food, features a family of polar bears who get increasingly obese as they drink beverage after beverage. One of them also gets diabetes and has to stash insulin in the fridge next to the sodas, all before having a foot amputated. He also appears to have erectile dysfunction. And it’s all set to the cheery sound of “Sugar,” by Jason Mraz. The ad was created by Alex Bogusky, famous for, among many other ads, creating the uber-creepy Burger King “King” character that inexplicably remained on TV for several years and spawned all sorts of related merchandise. Since leaving Crispin, Porter + Bogusky, he has become an advocate for public awareness when it comes to food, recently giving $100,000 to aid a California referendum that would require the labeling of food coming from genetically modified ingredients.